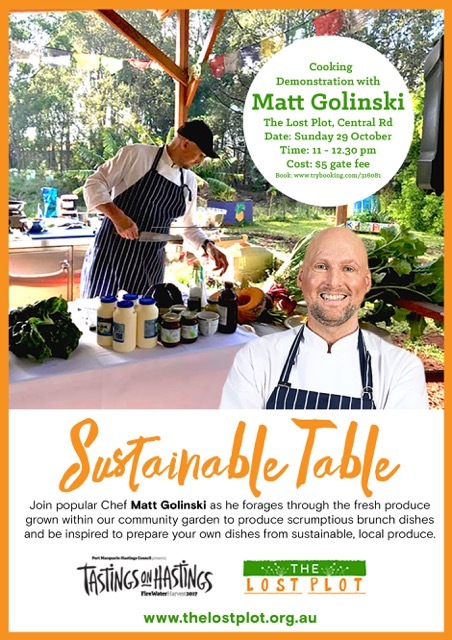 Join popular Chef Matt Golinski as he forages through the fresh produce grown within our community garden to produce scrumptious brunch dishes and be inspired to prepare your own food from sustainable, local produce. Matt will use community garden grown veggies complimented with produce from our fantastic local producers. Enjoy some yummy tasters and walk away inspired to use local and home-grown produce in your own kitchen. A small gate fee will be charged to cover the cost of this event to the community garden. This fee is non-refundable. The event will be held rain, hail or shine. Please bring a raincoat or umbrella if necessary. Make sure to book your ticket early, as spaces are limited. Online bookings can be made following the link below. Seedlings will also be for sale on the day.